Fig. 1. Experimental evidence of pressure-induced superconductivity in ZrTe5 single crystal. (A) Temperature-dependent electrical resistance R(T) at various pressures up to 3.9 GPa. Inset schematically shows the arrangements of pressure, magnetic field and current applied. (B) Magnetoresistance (MR) measured at the peak temperature of electrical resistance anomaly. The MR is strongly suppressed with increasing pressure. 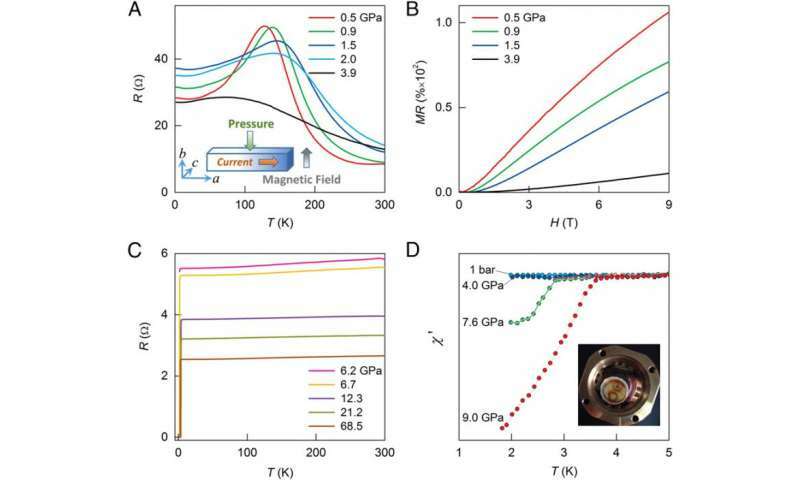 (C) The emergence of pressure-induced superconducting transition at higher pressures ranging from 6.2 to 68.5 GPa. (D) The real part of the ac magnetic susceptibility as a function of temperature at different pressures up to 9.0 GPa. Inset shows the image of experimental setup for the ac magnetic susceptibility measurements. Copyright © Zhoy Y, et al. (2016) Pressure-induced superconductivity in a three-dimensional topological material ZrTe5. Proc Natl Acad Sci USA 113(11):2904-2909. (Phys.org)—Due to their electronic and magnetic properties and their association with crystalline and electronic structures under extreme conditions, three-dimensional (3D) Dirac semimetals – that is, materials that possess bulk Dirac fermions that disperse linearly along all three momentum directions – are proving to be of great interest. Moreover, these materials allow high pressure as an effective, clean method of lattice tuning. Recently, scientists at high magnetic field laboratory of Chinese Academy of Sciences (CHMFL), Nanjing University, HPSTAR in Shanghai, and Carnegie Institution for Science in Washington combined multiple experimental probes, synchrotron X-ray diffraction, low-temperature transport under a magnetic field, and theoretical investigations to demonstrate the pressure-induced semimetal-to-superconductor transition in a Dirac topological semimetal zirconium pentatelluride (ZrTe5) compound. Prof. Zhaorong Yang and Phys.org discussed the paper he and his colleagues published in Proceedings of the National Academy of Sciences, in which they report their discovery of the pressure-induced transition of the three-dimensional Dirac semimetal zirconium pentatelluride (ZrTe5) to a superconductor by combining synchrotron X-ray diffraction, magnetic field low-temperature transport and theoretical investigations. "Three-dimensional Dirac semimetals are neighbor states to other exotic phases such as topological insulators, Dirac semimetals, Weyl semimetals, superconductors, and even topological superconductors," Yang tells Phys.org. "Recent theoretical and experimental studies show that ZrTe5 is a very promising system that hosts topological properties and might help to pave a new way for further experimental studies of topological phase transitions." These discoveries spark the present team of scientists' interests to further investigations on its Dirac and topological characters in ZrTe5 under high pressures, since pressure has proven to be an effective method for tuning electronic properties of materials by extensive studies. Prof. Jian Sun (an author of the paper discussed in this article) notes that "The sample is small, experiments are performed under extreme conditions and the signals are not strong. So it is very difficult to determine the crystal structures of high pressure phases based on the experimental data only. 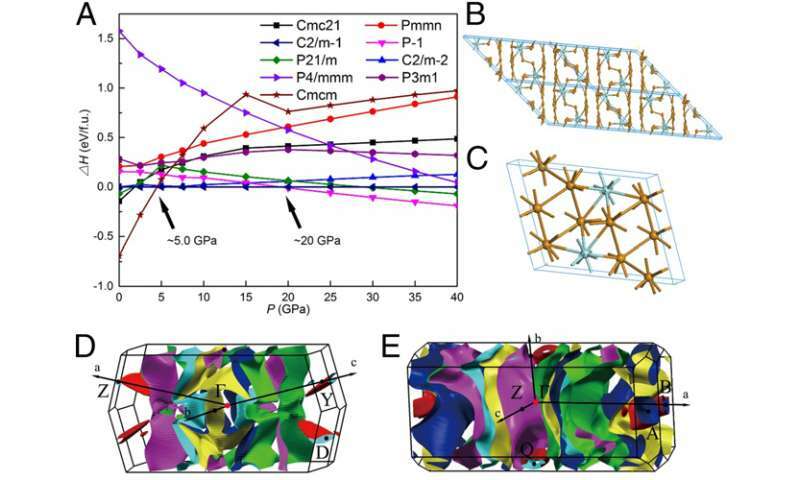 Our theoretical crystal structure prediction technique provides us the best candidates under the experimental circumstances and can be compared with the measured signals to eventually nail down the real structures." "We first conducted resistance and AC magnetic susceptibility measurements on ZrTe5 single crystals at various pressures up to 68.5 gigapascals and observed two superconducting phases," Yang adds. One gigapascal (GPa) is equivalent to 1,000,000,000 pascals (Pa) – the standard unit of pressure defined as one newton per square meter. "However, we noticed that the constructed pressure-superconducting phase diagram is very similar to that of tellurium, possibly due to the decomposition of ZrTe5 under high pressure." To determine the origin of this transition, the researchers carried out in situ high-pressure synchrotron X-ray diffraction and Raman spectroscopy measurements combined with theoretical calculations. "We're very lucky that both experimental measurements and theoretical calculations identified that the superconducting phases are coming from a two-stage structural phase transition." The scientists found that (1) the appearance of superconductivity at the critical pressure is accompanied by the complete suppression of the high temperature resistance anomaly around 128 K, showing a structural transition from the Cmcm to C2/m space group, and (2) that at pressures above 21.2 GPa, a second superconducting phase with P-1 space group structure manifests and coexists with the original C2/m. (In mathematics and physics, a space group is the symmetry group of a configuration in space, usually in three dimensions.) "The superconductivity often appears in compounds which are close to a structural, magnetic, or electronic instability. More recent investigations have revealed that the high temperature resistance anomaly around 128 K is caused by temperature induced Lifshitz transition, in which the Fermi surface undergoes a change in topology and a drastic change in the electronic density of states." In their study, the team demonstrated that the appearance of superconductivity at the critical pressure is accompanied by the complete suppression of the resistance anomaly and a structural transition indicates that both electronic and structural instabilities are responsible for the observed superconductivity. The paper reported that the possibility of topological superconductivity at higher pressure cannot be excluded, and so remains an open question, as well as while the researchers' theoretical study rules out the possibility of topological superconductivity at low pressure, at high pressure (above 20 GPa), the system has a complicated Fermi surface and a superconducting phase. "Of major interest in the field of topological superconductivity is the realization of Majorana fermions, which are predicted to exist as protected bound states in topological superconductors," Sun explains. "In contrast to most of the above-mentioned topologically-related states, which have been theoretically predicted and experimentally proven, topological superconductivity remains elusive." However, Yang continues, the Dirac semimetal is the neighbor state closely related to various quantum states ranging from topological insulators to topological superconductors. "This versatility makes the Dirac semimetal an ideal parent compound for the realization of topological superconductivity. Moreover, in order to study the nature of superconductivity, we further performed band structure and Fermi surface calculations at high pressures, and showed that the possibility of topological superconductor at higher pressure cannot be excluded, which deserves further investigations." Looking ahead, the scientists are planning to study the pressure-induced topological transition with the help of high magnetic fields and ultra-low temperature. "Currently, we're developing an integrated system which combines the extreme conditions of high pressure, high magnetic field (up to 35 T) and ultra-low temperature (0.3 K), so that we can explore the Fermi surface structures by probing the quantum oscillations of the normal state under high pressure." As to other areas of research, Yang tells Phys.org, the researchers believe that their study will be beneficial to material science – particularly for synthesizing novel superconducting materials.